Port Royal is a city located at the mouth of Kingston Harbor, in southeastern Jamaica. The area’s first inhabitants were the Taino Indians, who used the locale, which they called Caguay or Caguaya, during their fishing expeditions. Though it is not known whether they actually settled there, they did inhabit other parts of Jamaica. The Spanish first landed on the island in 1494 under the leadership of Christopher Columbus. Permanent settlement began in 1509 when Juan de Esquevil arrived with a group of settlers, searching for gold and silver. Finding no gems of worth, their alternative was to enslave the Taino Indians in order to farm the sugar cane which Esquevil had brought with him from England. (The Taino were so ravaged by their conflict with the Europeans and by foreign diseases that nearly the entire native population was extinct by 1600; to replenish their labor supply, the Spanish transported hundreds of enslaved West Africans to the island.) The Spanish monarchy never had much use for the area, except to prevent other countries from gaining free access to the island, which was strategically placed within the trade routes of the Caribbean. Spain maintained its hold on Jamaica for 146 years, until the English invasion of 1655 resulted in England capturing both the town and island. The English originally called the town Cagway, but quickly replaced this with the name which still survives: Port Royal. For much of the period between the English conquest in 1655 and a major earthquake in 1692 which destroyed the city, Port Royal served as the capital of Jamaica. After the earthquake, Spanish Town took over this role. In 1872 Kingston, the larger city, was designated as the capital, and remains so to this day. In 1657, as a solution to his defense concerns (the British lacked sufficient troops to suitably repulse an invasion), the governor of Jamaica, Edward D’Oley, invited the Brethren of the Coast to make Port Royal their home port. The Brethren were a group of pirates descended from cattle-hunting buccaneers who, after being robbed and subsequently ousted from Hispaniola (the second largest island in the West Indies, now divided politically into Haiti and the Dominican Republic) by the Spanish, had turned to piracy as a way of life. These pirates became legal English privateers who were given letters of marque (essentially legalizing their piracy) by Jamaica’s governor. The privateers attacked Spanish ships and settlements, forcing Spain to continually defend its property, thus depleting its resources and rendering it unable to retake Jamaica. Pirates such as Henry Morgan, Christopher Myngs, and Edward “Blackbeard” Teach launched raids on Spanish possessions; additionally, buccaneers Roche Brasiliano, John Davis, and Edward Mansvelt used Port Royal as a base of operations. In the eighteenth century, sugar replaced piracy as Jamaica’s main source of income. Due to depressed prices of cotton and tobacco (due mainly to stiff competition from North American farmers), Jamaican growers switched to sugar, which was quickly snapped up by the British, who used it in cakes and to sweeten tea. Hundreds of thousands of enslaved Africans were brought to Jamaica to work in the labor-intensive sugar industry, so that by 1800, black Jamaicans outnumbered white Jamaicans by a ratio of 20 to 1. By 1832 the median-sized Jamaican plantation had about 150 slaves. Though the British colonial government was eventually able to reach treaties with the Maroons (which were independent communities comprised of former African slaves who had fled to the island’s mountainous interior in the aftermath of the British invasion), dealing with the enslaved Africans proved to be far more problematic. There were over a dozen major slave uprisings during the 18th century, including Tacky’s Revolt in May, 1760. In that revolt, a slave overseer named Tacky led hundreds of slaves in the takeover of several plantations, killing many of their enslavers in the process. The rebellion was put down by a group of mounted militia acting in concert with several Maroons (who were bound by treaty to suppress such actions). Many of the defeated rebels returned to their plantations; the balance chose to commit mass suicide rather than return to slavery. In 1831 enslaved Baptist preacher Samuel Sharpe led a strike demanding more freedom for slaves and a working-wage of “half the going wage-rate.” The strike escalated to a full-scale rebellion upon refusal of their demands. The Baptist War, as it became known, was the largest slave uprising in the British West Indies, lasting 10 days and mobilizing 60,000 slaves. The reaction to this revolt by the British-led government and the “plantocracy” was brutal: Approximately 500 slaves were killed, many through various forms of “judicial execution.” The British Parliament held 2 inquiries into the circumstances surrounding the 1831 Baptist War Rebellion. The portions of these inquiries which depicted the conditions of the slaves contributed greatly to the Abolition Movement and subsequent passage of the 1833 law to abolish slavery as of August, 1834 throughout the British Empire. (In 1808 the slave trade itself had been abolished.) The Jamaican slaves were bound (indentured) to their former owners’ services, albeit with a guarantee of rights, until 1838 under what was termed the “Apprenticeship System.” The emancipated population still faced significant hardships; only after some time was the native and African populace granted the right to vote, and longer still until they were allowed to hold public office. The white members of Jamaican society managed to keep their hold on power until well into the 20th century. With the abolition of the slave-trade in 1808 and slavery itself in 1834, the island’s sugar and slave-based economy faltered. The period following emancipation was initially marked by a conflict between the Plantocracy and elements in the Colonial Office over the extent to which individual freedom should be coupled with political participation for blacks. In 1840 the Assembly (elected but highly unrepresentative) changed the voting qualifications in a way that enabled a majority of blacks and people of mixed-race to vote. But the planters maintained their grip on the elitist “legislative councils,” through which they exercised their primary concern: the continued profitability of their estates. The Jamaican planters, still reeling from the loss of slave labor, suffered a crushing blow in 1846 when Britain passed the “Sugar Duties Act,” eliminating the island’s traditionally favored status as Britain’s primary suppliers of sugar. The House of Assembly stumbled from one crisis to another until the racial and religious tensions came to a head during the Morant Bay Rebellion of 1865, which began when policemen were beaten with sticks and stones during a controversial trial of a black man imprisoned for allegedly trespassing on a long-abandoned plantation. Arrest warrants were issued for several men for rioting, resisting arrest, and assaulting the police. Among them was a Baptist preacher named Paul Bugle. A few days later Bugle led a group of protestors to the Morant Bay Courthouse. A small, inexperienced volunteer militia opened fire on the group after the protestors pelted them with rocks and sticks. Seven black protestors were killed. Governor John Eyre sent government troops under the command of Brigadier-General Alexander Nelson to hunt down the poorly-armed rebels and bring Bugle back to Morant Bay for trial. The troops, though meeting no organized resistance, began killing blacks indiscriminately, most of whom had no involvement with the riot or rebellion. According to the testimony of one soldier: “We slaughtered all before us… man, woman, or child.” In the end, 439 black Jamaicans were killed directly by soldiers, and 354 more (including Bugle) were arrested and later executed, some without proper trials. Over 600 black Jamaicans were flogged (including pregnant women) and many given long prison sentences. Thousands of homes belonging to black Jamaicans were burned down for no reason. George William Gordon, a Jamaican businessman and politician who had been critical of Governor Eyre and his policies, was arrested by the Governor for allegedly being behind the rebellion. He was executed despite having very little to do with it. His trial was held under conditions of martial law in Morant Bay, despite his having been arrested in Kingston. The trial and execution of Gordon via martial law raised constitutional issues back in Britain, where concerns emerged about whether British dependencies should be ruled under the government of law, or through military license. The rioting during the Morant Bay Rebellion – though suppressed ruthlessly – so alarmed the planters that the two-centuries old Assembly voted to abolish itself and asked for the establishment of direct British rule, in the form of the island transitioning to a “crown colony.” The new crown colony government consisted of a Legislative Council and an executive Privy Council containing members of both chambers of the House of Assembly, but the Colonial Office exercised effective power through a presiding British governor. In the late 19th century crown colony rule was modified: representation and limited self-rule were re-introduced after 1884, and islanders gained the right to elect 9 members of the Legislative Council. The colony’s legal structure was reformed along the lines of English common law and county courts, and a constabulary force was established. The smooth working of the crown colony system was dependent upon a good understanding and an identity of interests between the governing officials, who were British, and most of the non-official, nominated members of the Legislative Council, who were Jamaicans. The elected members of this body were in a permanent minority and without any influence or administrative power. The unstated alliance – based on shared color, attitudes, and interest – between the British officials and the Jamaican upper class was reinforced in London, where the West India Committee lobbied for Jamaica’s interests. The island’s white or near-white propertied class continued to hold the dominant position in every respect, though the next several decades witnessed the growth of a new Jamaican black middle-class consisting primarily of low-level public officials and police officers, drawn from the mass of the population whose social and political advancement was blocked by racial discrimination, limited education and opportunities, and other restrictions imposed by the colonial authorities. It would take until 1962 before Jamaica became an independent state within the British Commonwealth of Nations. 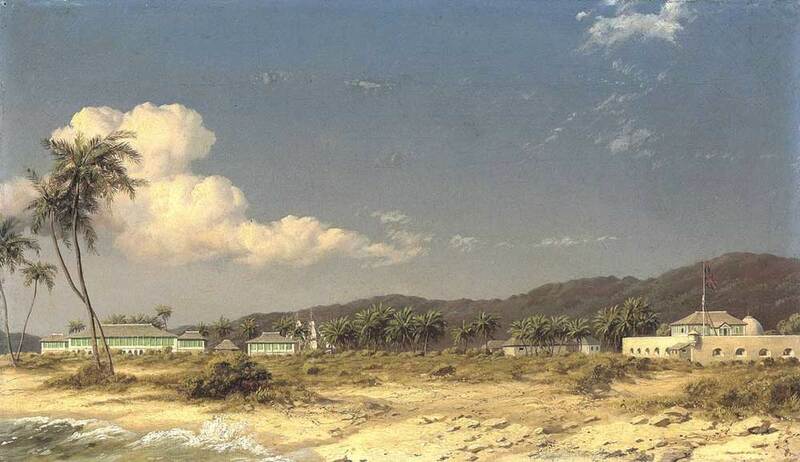 Our painting, an example of the “English School,” circa 1850, is titled A View of Port Royal, Jamaica. Painted by an as yet unidentified artist, it depicts the lush and verdant landscape of the infamous area once known as “the richest and wickedest city in the world.” The building on the right represents Fort Charles (originally called Fort Cromwell), the first port to be erected in Port Royal and the only one of numerous forts to survive the 1692 earthquake and tsunami. Today, Jamaica’s latitude and longitude are measured from the fort’s flagstaff. At its peak, the fort was protected by 104 guns and a garrison with 500 men. Many cannons still point out from their embrasures along the restored battlements. A small maritime museum stands in the center of the courtyard, containing a miscellany of objects – from glassware and pottery to weaponry – retrieved from the sunken city. Horatio Nelson, who later became Britain’s greatest naval hero, lived in the small “cockpit” while stationed there for 30 months. Behind the museum is the raised platform known as “Nelson’s Quarterdeck,” where the young Nelson kept watch for enemy ships amidst fears of a French invasion. A plaque on the wall of the “King’s Battery” commemorates his time there. Sitting alone just behind the fort is a small, red-brick artillery store known as the “1888 Giddy House.” During the second devastating earthquake to hit the area (in 1907) the sand-spit briefly turned into quicksand and one end of the building sank, leaving it at a lopsided angle. Next to the Giddy House is a gun-emplacement with a massive cannon, which also keeled over as a result of the power of the 1907 earthquake. In effect, what we are offering is a rare, well-preserved glimpse into the history of a locale whose wondrous, natural tranquility is juxtaposed with the tumultuous social and economic upheavals of the Colonial New World. Written June 2015 by Brian Flon, author of "Hell's Kitchen Requiem" (2014), available as an e-book at Amazon, ITunes, and Barnes & Noble.